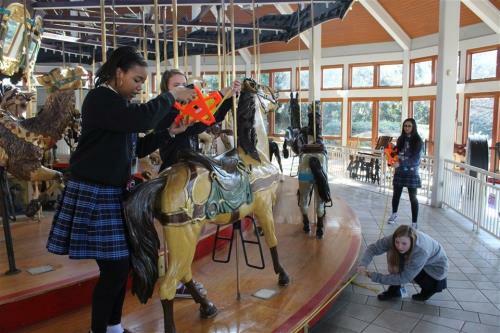 With stopwatches, tape measures, and calculators in tow, Mr. Bryant Haynes and his GPS honors physics students visited the Coolidge Park carousel to apply the physics principles of circular motion to a familiar experience. 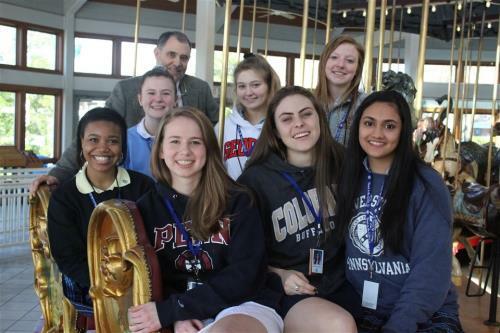 “Most students at GPS have experienced the joy of riding the carousel at Coolidge Park; most students have not realized the physics involved in this fun activity that for many is a part of their childhood,” Mr. Haynes says. In the classroom, Mr. Haynes’ physics students have been learning about uniform circular motion as well as tangential speed, centripetal acceleration, and centripetal force. Problem statements serve as the usual prompt for practicing these physical concepts. “The visit to the carousel is meant to solidify in a visceral experience what the meanings of each of these terms is,” he said. Students measured the various dimensions of the carousel, namely circumference and radius of the entire carousel and of each of the circles of figures, including the non-moving outer figures and the oscillating intermediate and inner figures. These variables—either directly or indirectly—come into the equations that describe the motion. The class then used stopwatches to time the initial increasing speed, steady speed, and final decreasing speed motions of the platform. From these measurements, students were able to write physical equations of motion for each aspect of the ride, including their own centripetal acceleration during their ride.